The Oden Institute for Computational Engineering and Sciences fosters interdisciplinary research and graduate studies for developing high-performance computing solutions to address complex societal problems. Our Ph.D. program ranks number one in the world according to CWUR. The Computational Science, Engineering, and Mathematics (CSEM) graduate program is an interdisciplinary program leading to the PhD degree that prepares students for the field of computational and mathematical modeling. The Oden Institute annually offers generous Postdoc fellowships coupled with employee benefits and relocation expense reimbursements. Applications are accepted until Jan. 1 for the following fall semester. Undergraduate offerings include summer internships, a certificate program, and a five-year joint degree combining a bachelor’s degree in Computer Science with a master’s degree in Computational Science, Engineering, and Mathematics. More than 35 of the nation’s best and brightest women in computational and data sciences came together on The University of Texas at Austin campus last week to network, collaborate and gain insight into what it takes to build a successful career in research and academia. Read more. A surprising amount of everyday life is governed by advanced mathematics. Aside from the motion of atoms or the rotation of the stars, complex mathematical methods guide social media feeds, medical imaging, and self-driving vehicles. 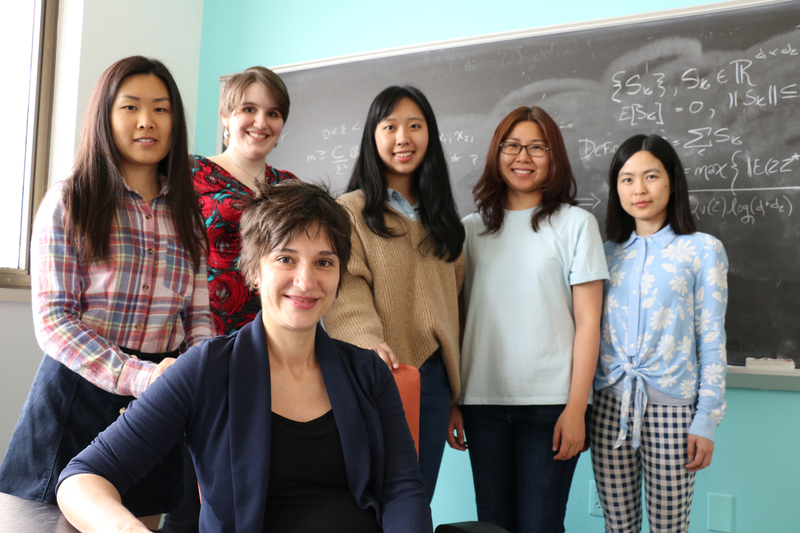 Rachel Ward, associate professor of mathematics and a data scientist at The Oden Institute, looks for those mathematical solutions that aid everyday life. She applies math in new ways for varied purposes: to rigorously justify existing methods for solving practical problems; to find faster or more accurate solutions to solve them; or to find solutions where none currently exist. Read more. The University of Texas System Board of Regents voted unanimously at their Feb. 13 meeting to recognize the "leadership and generous support" of the Institute's Founding Director J. Tinsley Oden. In his honor, the Institute was renamed the Oden Institute for Computational Engineering and Sciences. An event celebrating the new name is being planned for late spring. "As members of ICES, past and present, each one of us has been personally touched by Dr. Oden's vision, passion, leadership, and dedication. I could not be prouder to be the director of the Oden Institute," said Karen Willcox, who was selected to direct the Institute when Tinsley Oden stepped back into full time research in 2018. Read more. The findings suggest that it might be a bad idea to downsize an enlarged prostate through surgery or drugs, because doing so could lead to faster growth of prostate cancer. While the five-year survival rate for prostate cancer is generally very high, it is still one of the leading causes of death among men in the U.S., according to the Prostate Cancer Foundation. Read more. Many areas of science and engineering try to predict how an object will respond to a stimulus — how earthquakes propagate through the Earth or how a tumor will respond to treatment. This is difficult even when you know exactly what the object is made of, but how about when the object’s structure is unknown? The class of problems that deals with such cases is known as inverse modeling. Based on information often gleaned at the surface — for instance, from ultrasound devices or seismometers — inverse modeling tries to determine what lies below, whether it is the size of a tumor or a fault in the Earth. Read more. Andrew’s Ph.D. program races alongside his Olympic swimming dreams. He earned two undergraduate degrees in physics and applied math while swimming into the 2016 Olympic qualifying rounds. He hopes to do the same while pursuing his Ph.D.